The Journal of American History's round table on translations of the Declaration of Independence seemed like a natural candidate for on-line publication. Although the print journal was able to devote a substantial number of pages in the March 1999 issue to the round table, it could not also include the many versions of the Declaration of Independence, as it has been translated into different languages and at different times. On the Web, we are able to include this richer documentation. Where possible, moreover, we have also included "naive" retranslations back into English so that those who don't know the different languages can get a sense of how some key concepts and words have been rendered. 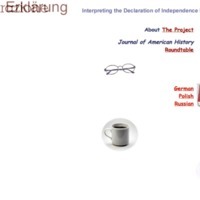 “Interpreting the Declaration of Independence by Translation,” RRCHNM20, accessed April 21, 2019, http://20.rrchnm.org/items/show/253.